Grapefruit makes for a yummy snack, but this power fruit’s uses extend far beyond the kitchen. 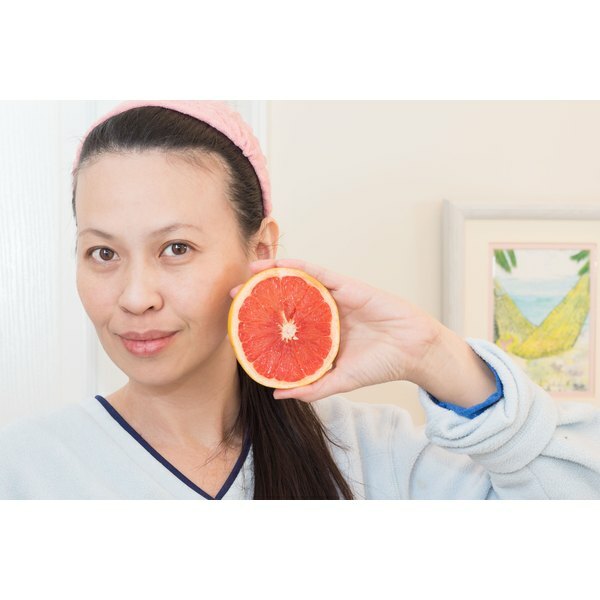 You can use grapefruit to make a facial mask for your skin. The citric acid in grapefruits helps to exfoliate dead skin and boost collagen, and the vitamin C in the fruit brightens and tones your complexion. Because it’s a natural ingredient -- unlike store-bought facial masks -- you know exactly what you’re putting on your face, and it's suitable for all skin types. As you slice up a grapefruit for breakfast to go along with your toast, save some to whip up a homemade facial mask. Peel ½ of a grapefruit with a knife and put the flesh into a blender. Zest up half of the grapefruit skin with a zester, and put that in the blender as well. Add a few drops of sweet almond oil, 1 egg yolk and 1 tablespoon of oats. Blend all the ingredients together to form a spreadable paste. If the mixture is too runny, add in a pinch of flour to thicken it up so it will spread and stay on your skin. Pour the mixture into a bowl, then spread it onto your face and neck. Avoid getting the mask into your eyes. Leave the facial mask on for about 20 minutes. Rinse the mask from your face with warm water. Pat your skin to dry with a towel, then apply moisturizer to rehydrate your skin.